Each one of your teeth contains a pulp chamber. Nerves travel from your pulp chamber down small canals in your tooth roots. 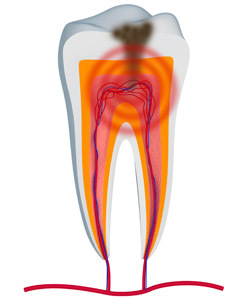 Sometimes the pulp chamber in your tooth can become infected. When the tooth infection reaches your nerves it can cause a serious, agonizing toothache. At Dental Care Today in Fishers (just east of Carmel), we can solve this problem and save your tooth using a root canal. Root canals relieve the suffering of patients dealing with a severe toothache. Before root canal therapy, dentists had to extract teeth when the pulp chamber became infected. Root canal therapy allows us to save your tooth and protect it from future infection. Dr. Behner has the skill and the experience to clean out the infection in your pulp chamber and ease your toothache. With root canal therapy, our patients can feel comfortable again. First Dr. Behner will remove the infected tissue in your tooth. Next, your dentist will clean out and disinfect the affected area of your tooth. Once your tooth is sterilized and the infection has been been completely cleared out, Dr. Behner will apply a special antibiotic and seal your tooth again. Root canals are topped with our beautiful, high quality porcelain crowns. For patients anxious about having a root canal done, sedation dentistry is a popular option. Sedation dentistry relieves the anxiety associated with a root canal procedure and relieves tooth sensitivity. Our sedation dentistry treatments in Indianapolis are popular for patients receiving a root canal, because sedation dentistry treatments allow them to feel completely comfortable in the chair. To find out more about root canal therapy, contact us at our office in Fishers. We would be happy to discuss the root canal procedure with you, and to answer any questions you might have. 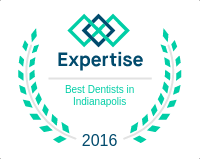 If you are suffering from a toothache in the Indianapolis area, including Fishers and Carmel, let Dr. Behner help you find relief today!